High school students will get to be particle physicists for a day by analyzing data from CERN’s Large Hadron Collider (LHC) at the University of Notre Dame, one of about 210 research institutes and universities in 42 countries around the world that will host daylong Masterclasses for local students. Masterclasses at Notre Dame will be held on March 12 (Thursday), March 13 (Friday) and March 21 (Saturday) at the Notre Dame QuarkNet Center. These international Masterclasses will give local high-school students the opportunity to explore the forefront of basic research in particle physics, one of the most important emerging fields in science. The discovery of the Higgs boson at the LHC in the summer of 2012 led to a large, international public interest in understanding particle physics. International Masterclasses offer high-school students the chance to experience this field of cutting-edge physics as they work with recent data from experiments at the LHC. The annual program equips students to work as much as possible like real scientists, and, like scientists, collaborate internationally. At the end of each day, the students will discuss their work via video conference. “As the students perform measurements with authentic data from the LHC, they gain an understanding of the process of scientific discovery," said Ken Cecire, a member of the national QuarkNet staff at Notre Dame who will be directing the video conferences at Fermilab. About 50 local students will be participating at the Notre Dame QuarkNet Center, and each group will join Masterclasses and physicists from different parts of the world including Santiago, Zurich, Seattle, Medellin, Palaiseau, Mona and Rossville through a video linkup. Through the video conference, the students will gain insight into the organization of modern research in an authentic environment. Four experiments — ATLAS, CMS, ALICE and LHCb — have made data available for educational use within the program. Students will examine the products of collisions between elementary particles that travel through the 27-kilometer accelerator at close to the speed of light. Some students will be rediscovering the Z boson or the structure of the proton, reconstructing “strange particles” or measuring the lifetime of the D0 particle, while other students will be hunting for Higgs bosons. ATLAS and CMS have made available real Higgs candidate events for students to track this rare, elusive and very short-lived particle. 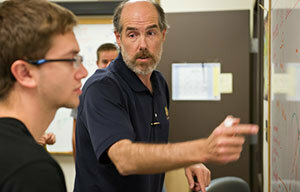 The Notre Dame QuarkNet Center has been hosting Masterclasses since 2007, and will be the only institute in the U.S. to host three Masterclasses. Daniel Karmgard, research assistant professor of physics at the University of Notre Dame, directs the daylong program at the Notre Dame QuarkNet Center. This year he will host students from Trinity School at Greenlawn, Riley High School, Adams High School and Winamac Community High School. International Masterclasses are led by Technical University Dresden and QuarkNet, in close cooperation with the International Particle Physics Outreach Group (IPPOG). IPPOG is an independent group of outreach representatives from countries involved in the research at CERN and other leading research laboratories. The group’s goal is to make particle physics more accessible to the public. Originally published by Marissa Gebhard at news.nd.edu on March 10, 2015.